1. Rice Pudding. I grew up with this dish. It wasn't like what I see other people make where cinnamon is integrated into the pudding. Instead it involves very few ingredients, and a two step process. You first cook the rice in the milk with a little salt, and then you melt salty butter in a fry pan until it begins to brown (the smell is nutty) and then you. You squish the rice on a plate and pour on the butter (I know how wonderfully healthy this must sound) and then you add the cinnamon and sugar on top of the butter where it soaks up the butter. This is my favourite dish in the world. Oh if life could be like a good rice pudding! 2. Black Liquorice. I grew up with this stuff (isn't it funny that the stuff we loved as a kid can have such sticking power as an adult?) My particular favorite thing with liquorice is licorice bullets. Liquorice covered in milk chocolate! Delectable! 3. 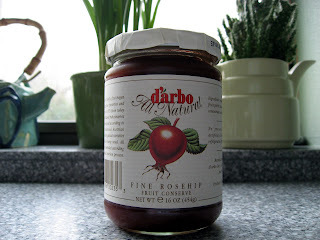 Rose hip Jam. A thick delectable concoction - doesn't really taste very rosy, but has a mellow earthy flavor a good one isn't too sweet either, more on the savory side. Eat with warm toast smeared with salty butter and then jam on top. Yum! 4. Vegemite. Yes I am Australian and yes this is a tad cliche but it can be really good (although it can be really bad as well). I'm of the school which states 'a little goes a long way'. Vegemite isn't to be used like a jam, or peanut butter. For me I have it on toast, bread or biscuits (by this I mean something like an Australia salada - dry water type cracker). A must is a layer or salty butter, and then a very small amount of Vegemite smeared over the top really nice. Try it with a piece of cheese on it (preferably Cheddar), the two flavors (salty, milky) work really well. 5. Tea. I love black tea - adore it in fact. 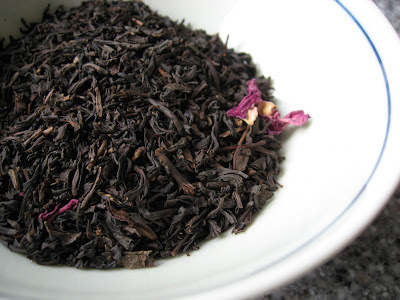 A good cup of strong black tea, made slightly murky by milk and sweet with sugar - delicious! Chocolate covered marzipan is one of my favourite things in the world and if it is covered in dark chocolate even better. I hope this helps in your endeavor to make your blog more personal... I've tagged you for a meme! Give me a decent hot cup of black tea with milk, and I am a happy bloke. I must drink 5 cups a day I reckon. Vegimite is great, but I do prefer marmite. The only bugger is that the taste stays in your mouth all day. I can keep #1 and 2?! Are you crazy - they are wonderful! I know a lot of people who intensly dislike liquorice and rice pudding, so I'm guessing you're not the only one! About the tea though - glad to hear it! Marmite? Bah! Vegimite all the way! Love love love rice pudding. The addition of butter, let alone toasty butter, never occurred to me amazingly enough. Next time, I'm doing it your way! And I'm definitely going to have to try the jam. Yeah I completely agree with all of your foods - except for licorice because Mum (Denise) used to make me eat it all the time. Yukky!